I didn’t want to write German Assault Troops of World War I, but my publisher requested I do so. If a publisher asks you to write books, it’s a good idea to accept. When I began my research, I still hated the military-history community for its closed-mindedness. Emblematic of this parochialism was the reaction to my discovery of something that nobody—not one person—on the face of the planet had noticed. In the larger scheme of things, it doesn’t matter, but it’s knowledge, and knowledge should be preserved. The flamethrower platoon of Assault Battalion No. 5 (Rohr) wore its death’s head sleeve badge above the cuff, while the men of the Guard Reserve Pioneer Regiment wore the badge on the cuff. These different positions are incontrovertible, based on photographic evidence. However, since nobody has found written orders saying that the members of the assault battalion would wear the badge above the cuff and the pioneers of the flamethrower regiment would wear it on the cuff, my discovery was ridiculed mercilessly. Why? Because it’s a new idea, and I have no pedigree. Captain Rohr would likely have wanted to differentiate his men from Major Reddemann’s, and I’m sure Reddemann argued that Rohr’s men shouldn’t be allowed to wear the badge at all, since it was a coveted decoration the Kaiser awarded only to his regiment. So a compromise was reached to placate these two prima donnas: Rohr’s men got to wear the badge, but above the cuff instead of on it. When I determined that the placement of the sleeve badges matters, military historians heaped scorn and derision on me. And then my publisher asked me to write another book for these people. There have already been many, many volumes written about German assault troops of World War I. After much thought, I realized how to stand out: I should avoid rehashing the history and development and concentrate instead on organization, tactics, weapons, equipment, orders of battle, and uniforms. I also included written orders for specific shock-troop operations and long excerpts from training manuals. Thus my book is different from all the others. My work is widely plagiarized. I don’t care. When the “experts” are interviewed, they still get everything wrong. I don’t care about that either. My plan was to become a military historian, but I’m not fond of the company I’d have to keep. So I’ll finish Assault Troops of World War I: the Central, Allied, and Neutral Powers, and then I’ll close the door on this failed chapter of my life. I’ll leave the crowd of mocking experts with this: You were right about the sleeve badge of German flamethrower troops. It wasn’t worn in two different positions. It was worn in four different positions. Position 1: on the cuff. Position 2: above the cuff. Position 3: at the top of the cuff. Position 4: overlapping the edge of the cuff. Position 1 represents flamethrower operators of the Guard Reserve Pioneer Regiment, while Position 2 identifies the men of Assault Battalion No. 5 (Rohr). My theory is that the other two positions indicate machine gunners and grenade-launcher crews, men assigned to the flamethrower regiment but not trained in the use of flamethrowers. Go ahead and laugh. Makes no difference to me anymore. I went into the field thinking new ideas would be welcomed. Sadly, I was dead wrong. Being wrong isn’t the end of the world for me. 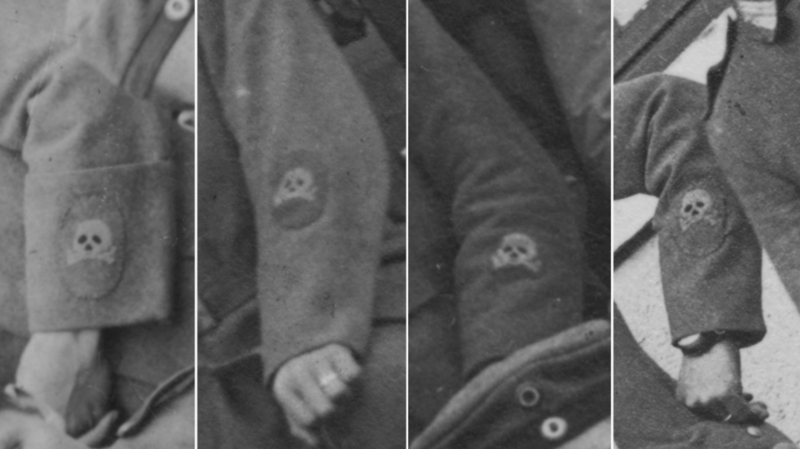 I could be wrong about the placement of death’s head sleeve badges that German flamethrower pioneers wore. What I’d hoped was that I’d write books that would spark discussion. Instead, people were dismissive, incredibly insulting, and even angry, as though personally affronted. So I resigned from military history. No big loss for me or military history. My tetralogy will be out there for anyone who wants to read it. I’ve got tons of projects I’d like to complete before I join Willy Rohr and Bernhard Reddemann. It’d be nice to have lunch with them somewhere and ask about the sleeve badges, but they’d probably get into a screeching fight over it, throwing food and mocking each other viciously the way military historians belittled me. We’ll never know the real story. That’s all right. I like mysteries. Read the Ghosts Trilogy. You’ll see.